Recently we talked about Smarter Customer Relationships with AI. We know AI is the future and it will be in all parts of our professional and personal lives. It has the potential to be a competitive advantage for your business. But where do you start and how do you get ready for AI? We already use systems with embedded AI capabilities. A simple example is the quality of search and recommendations you get on your favorite sites. More and more systems are being strengthened with AI in a seamless manner. This is more prevalent in the consumer space but enterprise software is catching up. Salesforce has launched Einstein to make AI part of everything that you do with their platform. It will democratize AI for all their users. This is a huge step in leveling the field for AI usage because not everyone has the skill and patience to leverage AI in custom ways. This will lift all boats. But if it lifts all the boats then what is your differentiator? Look at AI from a business impact perspective. Of course you understand your business very well. Now, you need to think ahead and put short term (3-6 months), medium term (12-18 months) and long term (18+ months) goals for impact that you want to create using AI. Identify the highest impact areas in your business and prioritize them. To prioritize in this way you will need a very good understanding of the capabilities and limitations of AI. 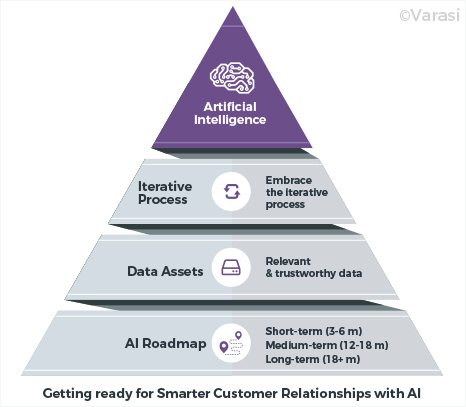 It is best to chart this roadmap in a workshop setting involving multi-department stakeholders to establish common ground around AI capabilities and marry them with the business priorities. Medium-term: Improve lead scoring and closure prediction by providing custom inputs specific to my company, domain, sales team, and product. Long-term: Have chatbot capabilities in my service cloud to improve customer service and reduce cost. Garbage-in-garbage-out – we have all heard this term. If there is one thing that can make or break your AI initiative, it is the relevance and quality of your data. Without the right data you can employ the best algorithms and the best people on the planet and you will still not get meaningful results. Setting up your data and data infrastructure is non-trivial. The more relevant data that you can make available, the better your AI algorithms will perform. Not all data will be in one place or even owned by you. Data will be inside your organization, with partners, data providers, government/public domain and so on. Making the data available to your team is not just a technology problem. There are a number of business, security and compliance related issues around data that are equally important and can show up as roadblocks. Someone senior enough in the organization needs to own this critical piece to ensure that the entire initiative doesn’t break down. The second part of the data puzzle is the technology. You need strong Big Data and distributed computing strategy in place. Most companies now do have this in some shape or form. But if you don’t, then its time to set it right because processing very large volumes of data using the old technology stack is just not economically and technically viable. One key aspect to consider in the design is the reality of a hybrid environment i.e. some data will always reside within your premises and some will be across various cloud systems that you have adopted. Remember, we are talking about a very dynamic world. Nothing is constant. Your business, customers, data, and customer behavior – everything is constantly changing. So there is no such thing as setting up an AI system and be done with it.